WAFFLES: Hi everybuddy, Waffles here. The Boss and I have something REALLY special for you today! It's a Valentines Giveaway from Laughing Cat Studio. At first I thought they made real live laughing cats, you know like me and the Boss. KATIE: Waffles, don't be ridiculous. When's the last time you saw me laugh? 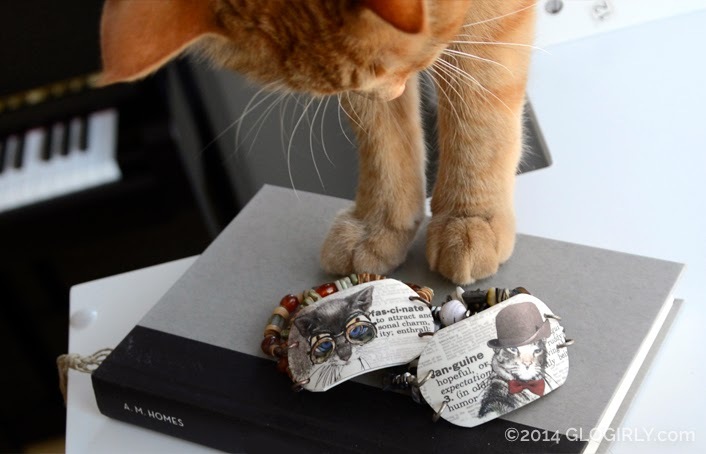 WAFFLES: Then when the package came, it was filled with lots of jewelry and stuff. Glogirly was all giddy and excited, so I guess that probably counts as laughing. But she's not a cat. Is she? KATIE: *sigh* Waffles, some time today. Jill Steele is the talented artist behind Laughing Cat Studio. It all started a few years ago when she saw some dictionary prints that used vintage clipart. She wanted to start her own company and began searching, digging and sifting through countless artisan-type products. There were lots of "I can make that" moments. But "I can make that" is a long ways away from opening your own shop. Inspired by a photo she took of her cat "Mouse" yawning, Laughing Cat was born. Jill combines her love of cats with dictionary art. Her medium is "shrink paper." ...think old-school Shrinky Dinks. 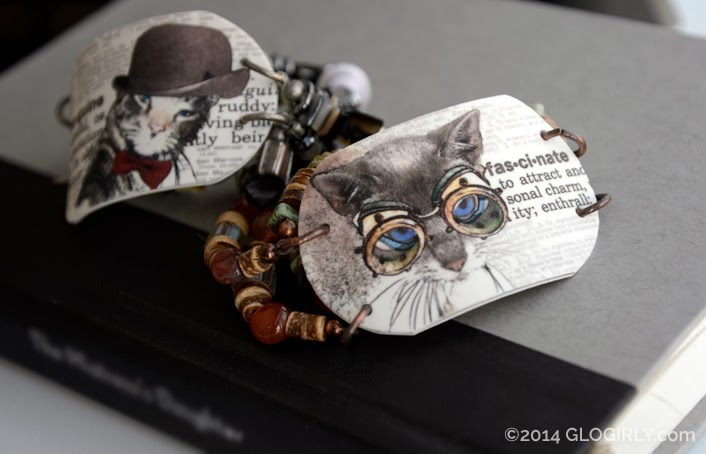 Each of her designs features one of her kitties with vintage-inspired graphic embellishments like top hats and goggles. She also does custom work and we're hoping she'll add a 'Katie' and 'Waffles' design sometime soon! She turns these pieces into unique and gorgeous necklaces, bracelets, art prints... even bookmarks and barrettes. She loves the way her designs look when they are shrunk down. The intricate details are amazing and we LOVE them too! Laughing Cat's studio is equal opportunity. In addition to feline focused fashion, there are some clever canine designs too. Here's the same 'Fascinate' design in a bronze, oval, choker-style pendant. It's finished with a sparkling crystal and hangs from skinny, triple leather cord. Waffles needs a pair of those cool goggles! This design features a delicious grey cat called 'Complacent.' Something Waffles NEVER is! The round bronze pendant hangs on a generous ball chain necklace. 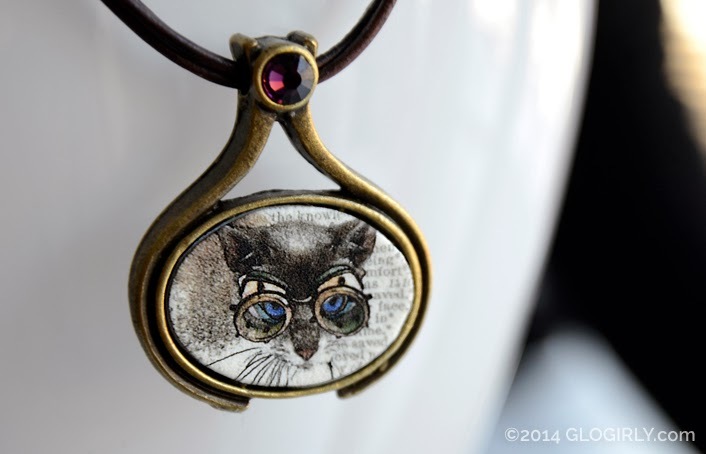 'Erudite' kitty adorns the delicate bronze starburst filagree pendant. All of the pendant styles are very lightweight and comfortable and they also look great layered. 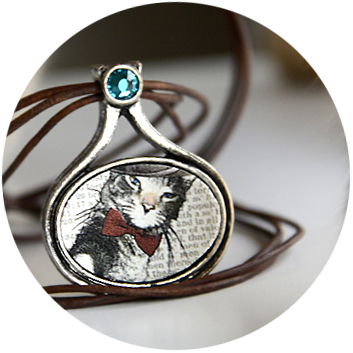 See all of the Laughing Cat Pendants. 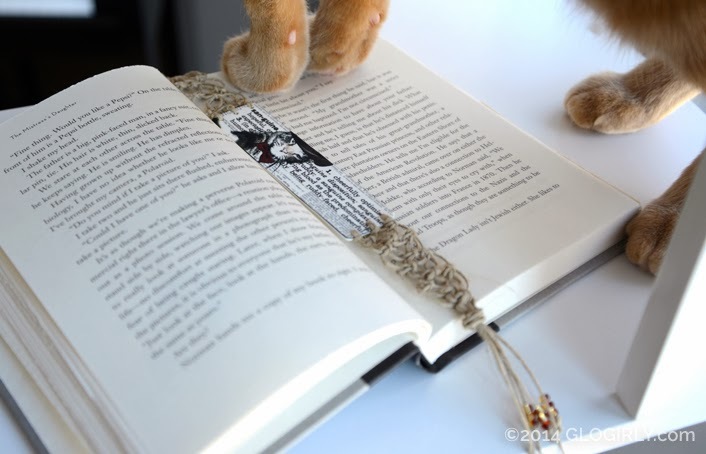 The dictionary inspired designs are purr-fect as a bookmark. Each is individually made with hand-knotted flax and beautiful beads. 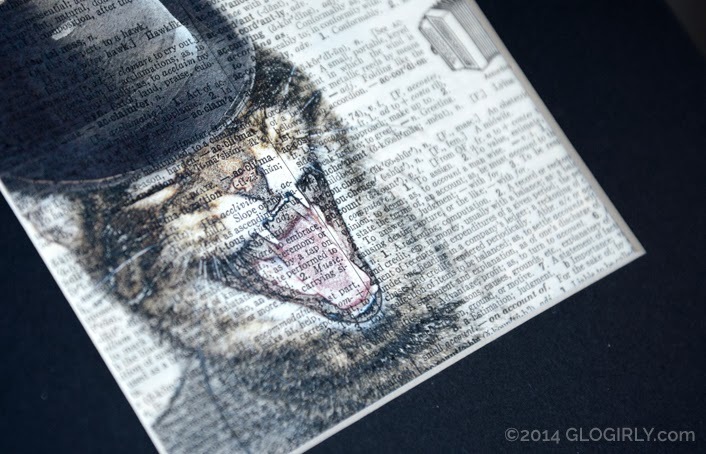 Printed on up cycled, vintage dictionary pages, Laughing Cats art prints are a whimsical interpretation of old and new. 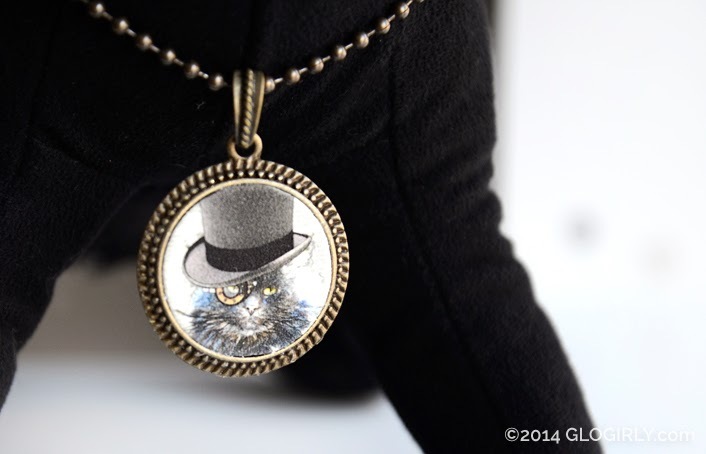 We think they'd look purr-fect in every style of room, from victorian to modern. See the whole collection of dictionary prints. Glogirly was thrilled with the intricate details in the designs and the quality of the pieces. Prices are extremely reasonable. The hardest part about shopping Laughing Cat's site is deciding WHICH piece, ok pieces, you want. Prices are extremely reasonable. Art prints start at $12.50, jewelry ranges from $18-28.00 and bookmarks are $12.50. Cats? You say CATS? Jill will only admit to having 7 furry felines in her family: George, William, Henry, Clyde and their mother, Cleo. These guys were all born in her backyard a year and a half ago and she just couldn't part with them. Also at home is Miss Betty White Cat and her adopted brother Mouse who she liberated some 2 years ago from the neighbor kids that thought catching kittens was cool. She also had a 15 year old wonderful fella named Fetch, but he went to the bridge last summer. Oh, and there's Scout, a 14 year-old rescue border collie mix and a just-rescued pup named Fidget. Laughing Cat Studio Valentines Giveaway! One GLOGIRLY reader, anywhere in the WHOLE-WIDE-WORLD, will win a $50.00 gift card to spend however they like in the Laughing Cat Studio online store. Enter below using Rafflecopter. The first two entries (leave a blog comment & email address) are mandatory. All other entries are optional. You may log into Rafflecopter with your Facebook account info or with your email. Deadline to enter - 11:59pm EST, Wednesday, February 19, 2014. But Wait! There's More! Save 20% NOW! FTC Disclosure: We received this product for review at no charge from Laughing Cat Studio. We also received a small fee to cover the time it takes to test, take photos, write the review and administer the giveaway. Receiving the product & the fee did not influence our review. All reviews on GLOGIRLY will always reflect our honest & unbiased opinions. There are at least 43 pieces i want, but those dictionary prints are SO awesome! Then again, so are the necklaces! OMC! That's me on that pendant! Must. Win. Pendant. Holy CAT! We WANT! We WANT!!! Erudite! Or Perspicacious or...or...oh Bother! How could I not love the Superior Cat since I live in Superior? I'd love a custom pendant with an image of my old boy Merlin. They be great for memorials too. Being a lover of steampunk fashion and having just completed a very beautiful outfit for Halloween, I adore the style of this jewelry and the art prints as well. It's so hard to pick just one of the designs as my favorite, but I think I have it narrowed down to Quixotic or Tenaciuos...oh, but Complacent is fantastic too. Argh! I can't decide. I definitely like the stretchy bracelet designs. Too many to pick just one for sure. Once I have more funds of my own, I'll be adding to my outfit, I foresee. They are beautiful and I would love to enter. I can't get to the web site though. I am getting the message "Forbidden Error". The barrettes are awesome and the prints too. I could do some real damage to my credit card at Laughing Cat Studio! That's cool stuff! Katie & Waffles would make good kitty art too! I love sardonic cat. As a pendant. How adorable they all are! I love Sanguine Mouse Pendant, looks adorable with the bow tie. Those kitties had us MOL this morning. What great jewelry! The mom says she loves it all! Those are SO cool! I think I love all of it!! But especially the goggles. Yes, Waffles needs some of those goggles! We love everything we saw and would love to win so we could get something for Mom. Wow that is some awesome jewelry! OMC we would love to win one of these for Mom. She loves Fascinate in the oval bronze and Sanguine Mouse and.....wow....almost everytyhing!!! Wow, love these! The dictionary pages are just fabulous! I like the silver horizontal oval necklaces, they are so beautiful! All of the stuff I saw at their studio i loved though. It's very unique and I love unique!!!! Have a great day and i'm lovin your giveaway! I need some of those goggles too! Those are seriously classy and cute! I don't usually wear jewelry but one of these necklaces would never come off. Absolutely LOVE these. Very classy and could be worn dressed - up or casual! All of these cats prints are great! And hilarious! I'd probably get the Urbane print on a bible page and hang it up. Sorry, forgot to say - we love the shrinky bracelets! 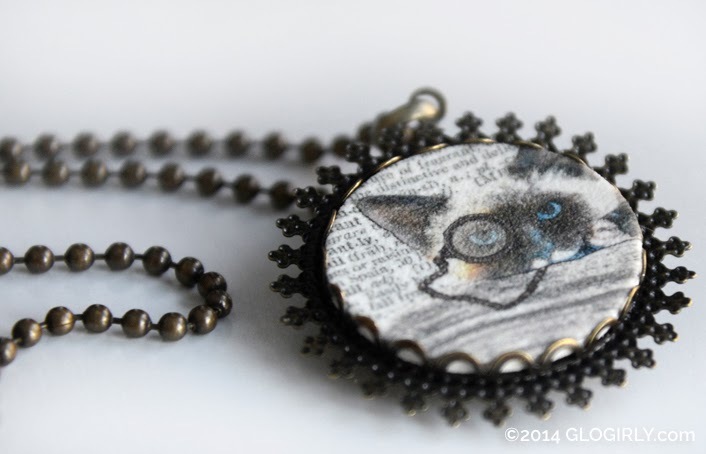 My favorite item is the Large Silver Filigree Oval Pendant – At Peace: A Persian - I just love the expression on the cat's face! I really like the quixotic kitty bracelet. My favorite piece is the LARGE SILVER FILIGREE OVAL PENDANT – RISIBLE :) so cute! Oh cool. We still think that Glogirly has "movie star hair". Wes LOVES the Tenacious, A Hairless Kitty, it looks like mes,even though it is supposed to bes a hairless kitty! But if wes wins, we would get the Weimaraner one for the Gospel of Goose's Mom. What fabulous Art. I wanna see a ginger tho. It's all so great. I love Inquisitive George. Such unique items, just love it. Very nice! Very nice, indeedy!!! Those are beautiful pieces. I'd love to wear one. 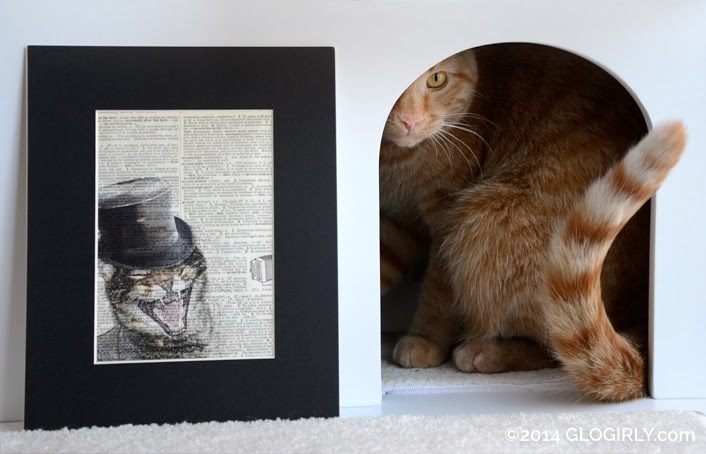 The Sanguine Mouse print would look lovely inour cat room. I would love to get the Dictionary Print – Sardonic. The kitty looks just like ours. Those are all beautiful pieces. Mom would love to win but has no idea how to choose if she did. 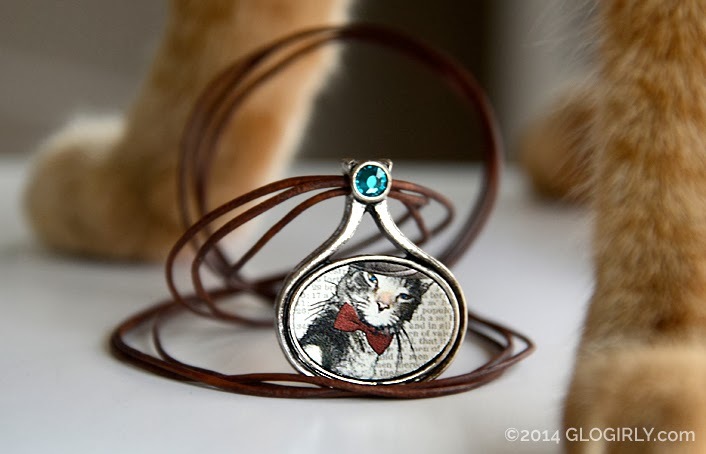 Beautiful... but we'd only want cat jewelry. No dogs at our house! What beautiful art work! We would love to win to!